Update, May 25th: Dave has released an update to the Windows version of CtrlAltStudio 1.2.1 to correct some issues with the controller not being recognised by the viewer. The updated version is 1.2.1.41169, available from the same CtrlAltStudio blog post as linked to in this article. On Monday May 12th, Dave Rowe (Strachan Ofarrel in SL) released CtrlAltStudio version 1.2.1.41169 (Win) and 1.2.1.41167 (Mac). This brings with it a number of fixes and updates, and sees CtrlAltStudio maintain parity with the Firestorm 4.6.5, which appeared on Sunday May 11th. Most intriguingly, it includes support for the Xbox 360 controller, which appears to be aimed at reducing reliance on the keyboard for a range of tasks when wearing an Oculus Rift headset (although it is by no means constrained to just that use). The release is for both Windows and Mac, and it is strongly recommended that a clean install is performed. CtrlAltStudio 1.2.1401169/67 allows you to use the Xbox 360 Controller to walk, fly, use flycam, orbit about points in 3rd person view, click on objects and use context menus with objects. It works in 3rd person view and Mouselook and can be used with normal, stereoscopic 3D, and Oculus Rift display output. However, please note that so far, this has only been tested on a Windows system. Once connected to your computer, the Xbox 360 Controller should be calibrated (e.g. by using the device’s properties provided via Windows’ Devices and Printers folder). 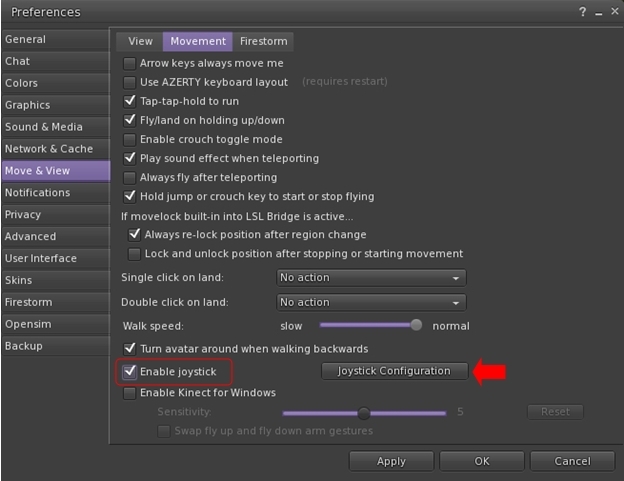 It can then be enabled for use with SL by launching CtrlAltStudio 1.2.1 and enabling the controller via Preferences > Move & View > Movement > Enable Joystick and then using the Joystick Configuration button to configure it for SL. Note that the settings displayed in the Joystick Configuration panel are not those supplied by LL; they have been adjusted to provide defaults specific to the Xbox 360 Controller. Avatar jumping at less than maximum walk speeds fixed. I don’t actually have an Xbox system (360 or otherwise), so I cannot say how the controller works. However, Dave notes that BillyBob Snowpaw did a considerable amount of testing, so those with a controller shouldn’t experience anything untoward happening. With Linden Lab continuing to work on the Oculus Rift integration. Given the problems inherent with using that HMD with a keyboard, it’s good to see that other options are being looked at by TPVs. while the Xbox Controller won’t help with typing, it would certainly appear to make avatar / camera / cursor movement a lot easier when used in combination with an HMD, and even with stereoscopic glasses. So opens the description of Glyph Graves’ Ghosts of the Internet, a fascinating installation which continues the artist’s reflections in virtual space. 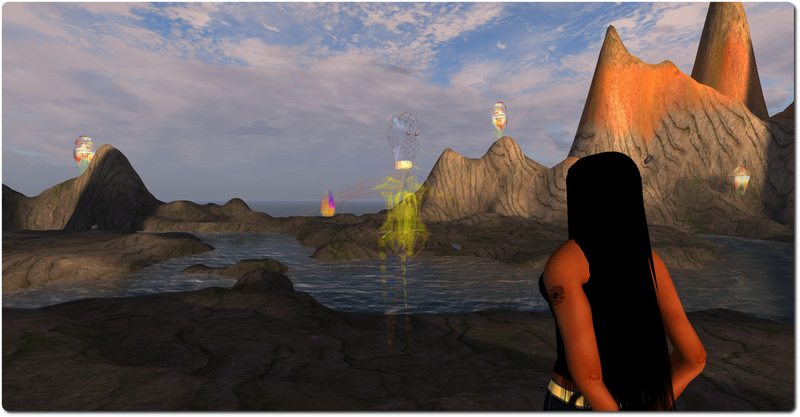 Fascinating, because it exists both in Second Life at LEA21 and in the Inworldz region of Translation – and those in one can see the “ghosts” of those in the other moving around, and can even converse with them. The landing point at each installation provides instructions on how to get started, together with recommended graphics settings (using Firestorm as the example). 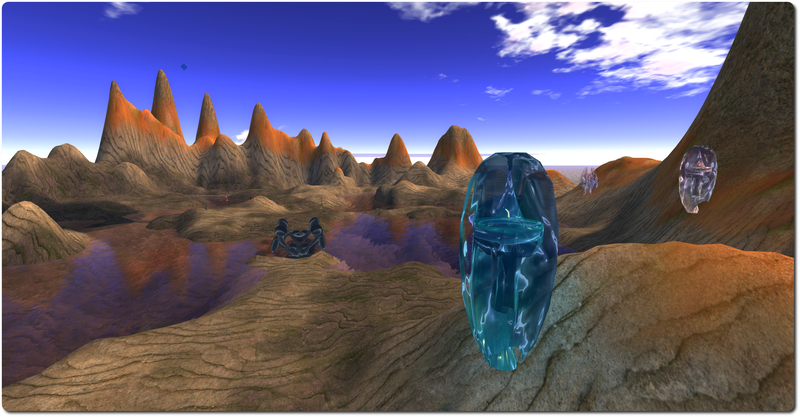 There’s also a teleport to deliver you to ground level, which is more-or-less identical in both regions (Sasun Steinbeck provided a tool to help copy items between the two environments), comprising barren rock, partially flooded and surrounded by tall hills. Within either landscape sit a series of semi-transparent otherworldly forms, with shifting colours within, which might be taken as alien crystal growths or exotic sculptures. 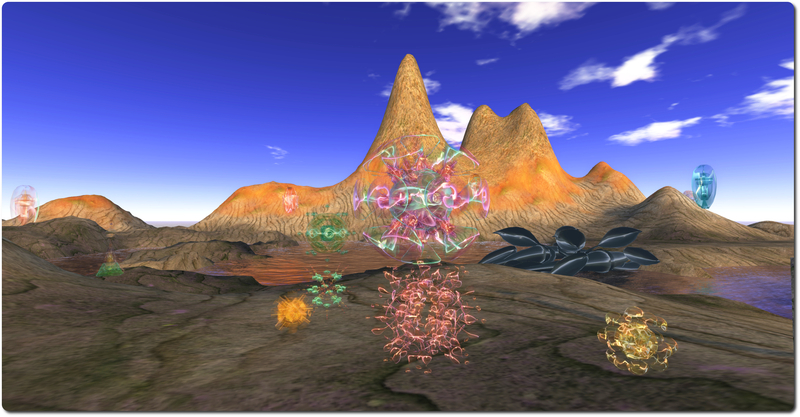 Some of these are the “bridge” between Second Life and Inworldz, allowing communications between the two to take place. Others, spread around the borders of the landscape are the Pylons of Binding – move beyond them, and contact with “the other side” is no longer possible. Snails also roam each of these realms, and at least one is large enough to slide run over you if you’re not careful, although they are shy: touch one, and it will retreat into its shell for a few seconds. But it is the ghosts which are really the focus here. These appear whenever someone on either side is within the boundaries set by the Pylons of Binding (although if there is no-one in the region on the other grid, no ghosts will be visible). In other words, the ghosts that appear represent avatars visiting the installation on the other grid. Communications between world is initiated by touching a ghost (which will then become somewhat multi-hued) and then typing into open chat (you may have to wait for the “ghost” to respond to your initial touch first). Only one conversation with a ghost can be established at any given time, so if you touch a ghost already in a conversation, it will not respond to you. It is also not recommended that you touch several ghosts at once to initiate multiple conversations, as “bad things will happen” as a result (and it might get very confusing). Be aware that whatever you say to the other person is also repeated in open chat at their end of the link, not in IM, and so will be heard by anyone else who is near them. Chat from any other avatars around you, however, is not transmitted. To terminate a conversation, or if you do not which to speak to someone on the other side who touches your “ghost” there, simply touch the appropriate ghost to terminate the connection. If you have accounts on both Inworldz and Second Life, Ghosts of the Internet brings a whole new level of meaning to the expression “talking to oneself”; nevertheless, it is an easy means of experiencing the installation should there otherwise be on-one else on the other side with whom you can converse. Alternatively, if your focus is solely on Second Life, you can enjoy something of the experience by having a friend hop over to Coppelia, and converse with them from the Ghosts of the Internet installation on LEA21. As well as being a fascinating technical / artistic piece, Ghosts of the Internet carries with it echoes of the past. 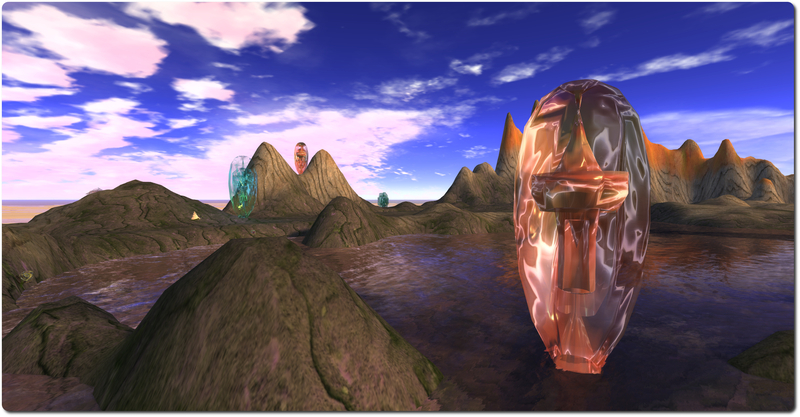 Remember the heady days of 2008, when a group of brave explorers set-out to move between dimensions, travelling from Second Life to OpenSim, and the promise therein? 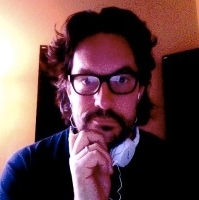 It is also – possibly – a hint of a potential future, given Ebbe Altberg’s comments on SL and the metaverse. So, for a while at least, there are ghosts on the grid, and echoes in the metaverse. See them and hear them while you can. Recommended. Got a question about the VR metaverse? Put it to the experts! The first Silicon Valley VR (SVVR) Conference and Expo will take place on Monday 19th May and Tuesday 20th May 2014, at the Computer History Museum, Mountain View, California. The conference will bring together a host of experts in the VR and in virtual environments, including the likes of Palmer Luckey (Oculus VR), Philip Rosedale, Ebbe Altberg, David Holtz (Leap Motion), Ben Lang (Road to VR), Jan Goetgeluk (Virtuix) and many more – see the list of speakers and panelists on the conference website – as well as including exhibits and demos from some of the top names in the field. Both the Drax Files Radio Hour and New World Notes have secured discounts of $100 per person on the two-day registration for those who are able to attend. Simply enter either code “drax2014″ or “nwn2014” when registering to claim your discount. But even if you can’t attend, you can still be involved. Here’s how. As a part of the conference events, Draxtor Despres of The Drax Files fame will be moderating a special panel, Creating the VR Metaverse. featuring Ebbe Altberg (Linden Lab), Philip Rosedale (High Fidelity), Stefano Corazza (Mixamo), Tony Parisi (Vizi). (l to r): Ebbe Altberg, Philip Rosedale, Stefano Corazza and Tony Parisi. Ready to answer questions on “Creating the VR Metaverse”. One global metaverse or many? If you have a question you’d like to put to this panel during the course of the proceedings, then please leave it in the comments following this article, and it may be selected by Drax to be asked during the course of the discussion. Perhaps your question relates to one of the topics listed above, or perhaps you’re wondering if the idea of a just a “VR metaverse” is too narrow, and any future metaverse should also embrace augmented reality (AR) as well; or perhaps you’re wondering why and how any new metaverse might enjoy wider adoption in the world at large than we’ve seen with the likes of SL and OpenSim; or perhaps … Well, you get the idea. You can address your question to an individual member of the panel or to all of them or any combination in between. All that’s required is that your question is pertinent to the panel’s theme, creating the VR metaverse, is polite, and is suitable for the forum in which it is to be asked. Obviously, and depending upon the number received, not every question submitted will necessarily be asked (as questions will also be taken from the live audience) – but if your question is liable to get the panel thinking or generate some interesting / thought-provoking replies, then it may well get selected. Just make sure you have provided it in the comments below no later than 20:00 on Monday May 19th.